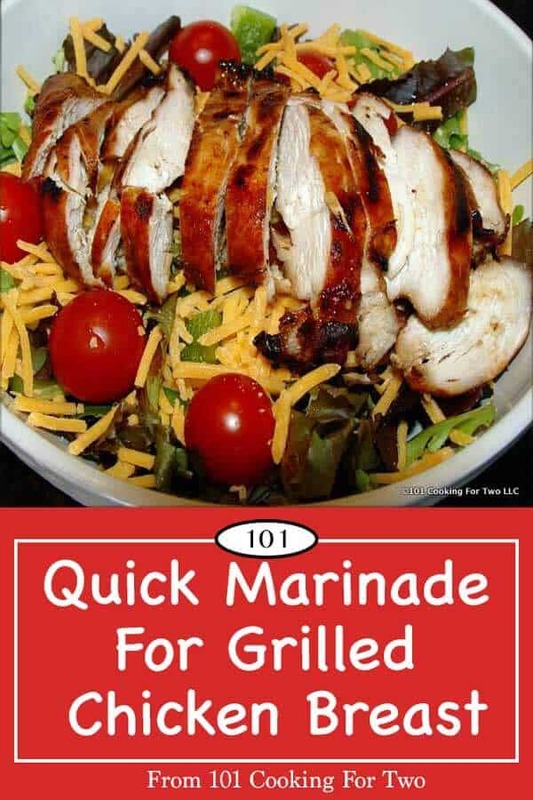 Quick and easy with wonderful taste, this simple marinade for grilled chicken breasts makes a great main course for a special dinner or the perfect topping for a lunch salad. Editor’s Note: Originally published April 17, 2010. Updated with updated text and photo re-editing. The marinade stayed the same but the cooking technique updated to my current method. Please enjoy this tasty recipe. This could easily be a weeknight recipe since 20-30 in the marinade works well. Just enough time to heat, clean and oil the grill. If you brine first (not a bad idea ever with grilled skinless chicken), do not add the salt. A very solid 4 and could be a lower 5 if you brine. 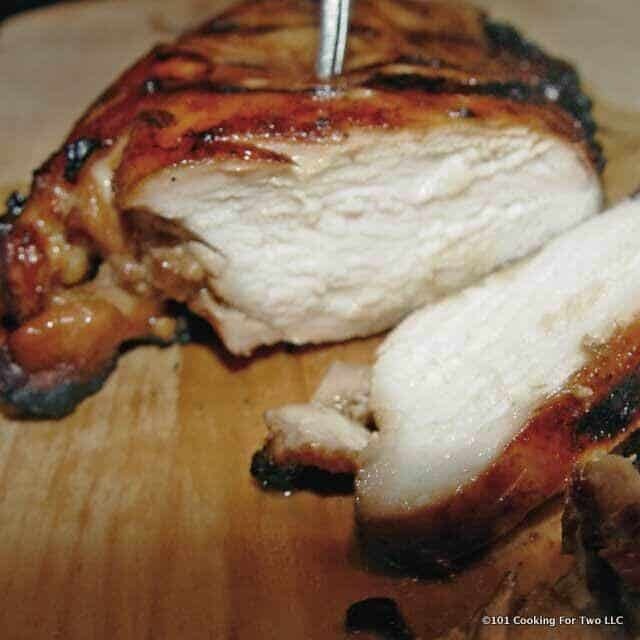 We all know that skinless boneless chicken breast can be tasteless and have a hockey puck quality if not done correctly so careful grill is a must. 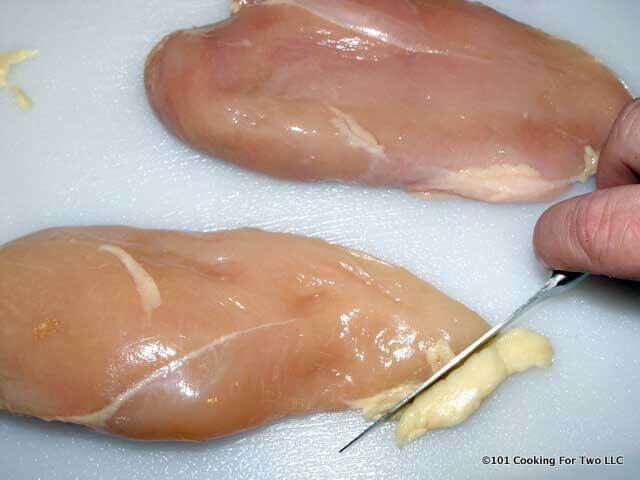 The first tip is to try to cook chicken breasts of about the same size and thickness. If one is just thicker, a meat mallet or bottom of a heavy pan can be used to even them out. A brine is always a good thing, and if you have time, you will be glad you did. A recommended quick brine of 2 cups of water and 2 tablespoons salt for 30 minutes to 2 hours. This is relatively heavy in salt and is recommended by Cooks Illustrated. The chicken gets saltier if over 1 hour so I’m suggesting 1-hour max. While we no longer recommend rinsing chicken, you should always rinse carefully after brining. Also, don’t add any more salt after a brine is used. 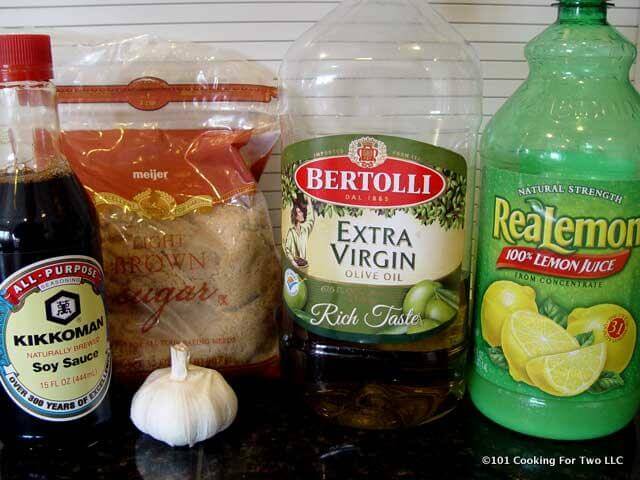 This marinade is extremely tasty and has soy sauce, brown sugar, olive oil, lemon juice, garlic, and a little salt. The most important part of this recipe is to not rush the cooking. I used a grill surface temperature of 450 which is a tad above medium on most grills. Total grill time of about 30 minutes. 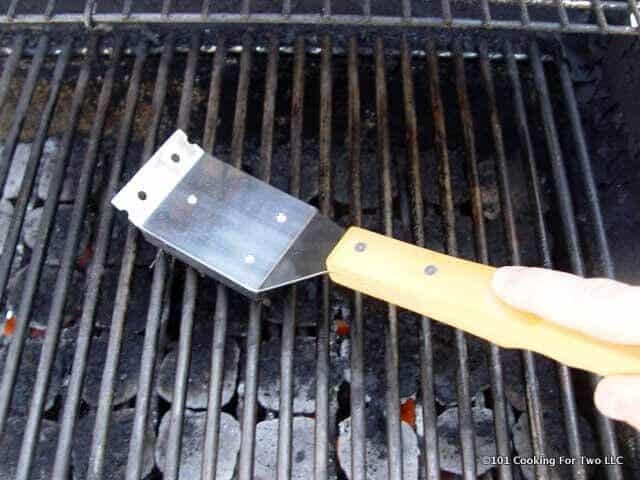 If you have questions about controlling your grill temperature, please check my A Beginners Guide to Grill Temperature on a Gas Grill. Trim chicken breasts of any excess fat. 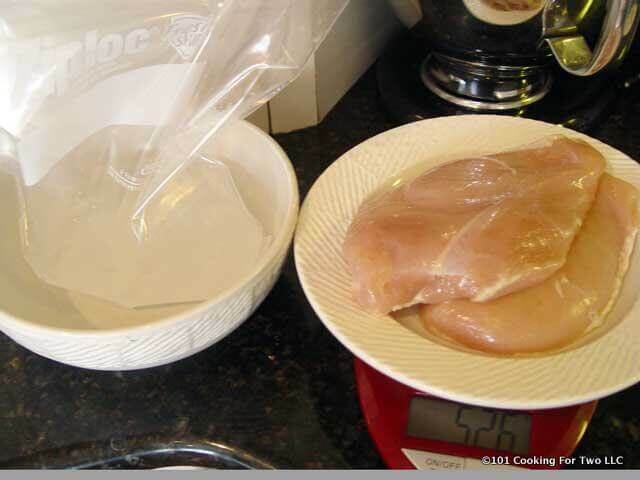 Optional brine: If you have time, brine is always a good thing for skinless boneless chicken breasts. I suggest a brine with a simple brine of 2 cups water and 2 tablespoons table salt for 20-120 minutes. If you brine, remove the salt from the recipe. If you like the minimal salt taste, use only 1 tablespoon of salt. In a 1-gallon zip lock bag, combine soy sauce, brown sugar, olive oil, crushed garlic, and lemon juice. Add salt if you didn’t brine. Add chicken to bag, remove extra air and seal. Place in a large bowl after mixing well. If using in 30 minutes or less, leave at room temperature. If longer then refrigerate. You should then remove from refrigeration about 30 minutes before grilling and rinse. Remove breasts from marinade and place over direct heat. Flip about every 5 minutes. Remove from the grill at an internal temperature of 165. About 30 minutes of total grill time. Optional brine: If you have time, brine is always a good thing for skinless boneless chicken breasts. I suggest a brine with a simple brine of 2 cups water and 2 tablespoons table salt for 30 to 120 minutes. If you brine, remove the salt from the recipe. If you like the minimal salt taste, use only 1 tablespoon of salt. In a 1-gallon zip lock bag, combine soy sauce, brown sugar, olive oil, crushed garlic and lemon juice. Add salt if you didn't brine. Add chicken to bag, remove extra air and seal. Place in a large bowl after mixing well. If using in 30 minutes or less, leave at room temperature. If longer then refrigerate. You should then remove from refrigeration about 30 minutes before grilling. Flip about every 5 minutes. Remove from the grill at an internal temperature of 165. About 30 minutes total grill time. A brine is always good when you grill chicken. If you brine, rinse off the brine carefully and do not add any salt to the marinade. Grill surface temperature must be correct. I am going to try using this recipe using a instapot (electric pressure cooker) & a 10lb bag of leg quarters after I removed the skin and de-bone it all. I am making 3 cups of rice in the pot first and setting it aside. Then after letting the chicken marinade in the refrigerator for at least and hour, maybe two, I will put it all in to the pot and cook it 8 minutes on high. While doing all of that I will whip up some sriracha green beans in the skillet. I might try to thicken what juice is left in the pot after cooking with a tablespoon or two of corn starch and equal parts cold water slowly stirred in to the juices and brought to a boil to thicken. Sounds like a well thought out plan that should work great. I don’t use my instapot much. My mother had a few “accidents” with her pressure cooker and I’m not in a hurry. I broke down a whole chicken last night, 2 wings, 2 drumsticks, two thighs, then I left both breasts on the bone. I doubled the recipe, brined the whole thing for 30 minutes, then marinade for 30. I had to grill everything for 10 -15 min longer, but my god did this turn out amazing. I fed a family of 5 ( 3 kids – 8,6,3) and we ran out of chicken. EVERYONE at the table asked to have more. This recipe was a keeper and goes into the family recipe book. Luckily my wife keeps all of the ingredients in the house (we had to make our own brown sugar, but that wasn’t that hard) Truly AMAZING. Awesome looking marinade recipe…excited to try it, thought I was going to be doing so tonight, but wifey just informed of a change in plans…lol. 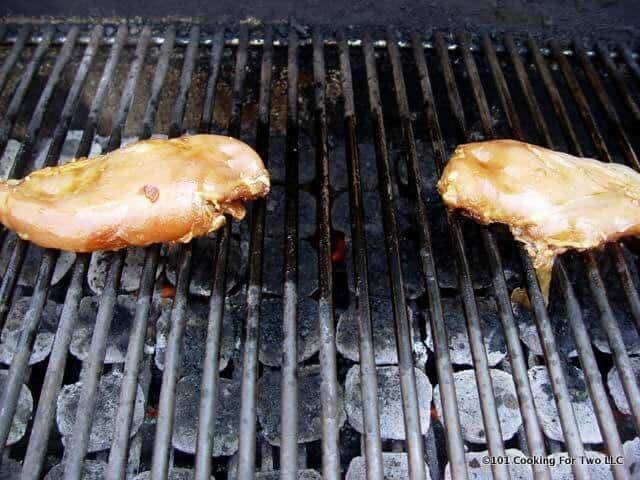 Dr. Dan, are you closing the lid when grilling the chicken? Closed. General rule: Less than 1/2 inch (fish) is open. 1/2-1 inch can be open but it is much harder control and over 1 inch is always closed. So always assume closed unless otherwise stated. It is open in the photos just to get the photos. Thank you, Dr. Dan…this sounds amazing! If I’m grilling 4 Breasts, was wondering if I should double all of the ingredients, both for Brine and Marinade? Amazing marinade! Had chicken breast in fridge and needed something to do with them and stumbled across this. Quick and easy. I did this before going to work at 9am, and let it sit all day and didn’t cook it till about 8pm. The longer the better. Since I had 5 breasts I upped the number in the recipe but didn’t use any salt since the soy sauce is salty enough and it came out amazing! Definitely going to use again. This is one of those recipes I forget about for a year then use it over and over again. Then I forget about it. Hi! I’m trying this tonight. Have the breasts brining right now (for two hours), then I’ll marinade for two hours. Do I have to rinse the breasts after brining? I usually brine my whole turkeys and typically rinse… I’m so excited to taste this! Thanks Dr Dan! Sorry for the delayed reply. Always rinse off a brine. If a brine did it’s job, you already have some extra salt. No need to add to that. I have been known to do things like that. It is all about ratios. My chicken was the best! Looked way better than in these pictures. I have excuses for the pictures. First generation digital camera and 4th month of the blog. Maybe I should redo this post next summer. I can’t grill at my apartment. when say use a grill pan do you mean in the oven or on stove top? With all the sugar in this, I would not be doing it stovetop. And in the oven, the chicken will take too long and again may burn before the chicken is done. Maybe not if you filp… If you try it in the oven, it would take 30-45 minutes depending on size and oven. Cook to 165 of course. I’m not sure how good that would work. You could do a pan sear method but I’m worried about burning the sugar. Yum! Totally transforms chicken, especially when you’re short on time for a marinade. We’re trying it on thin sliced pork chops tonight. Omg this marinade was perfect!! My computer won’t let me rate it but I definitely give it five stars! I added everything in the ingredients exactly except garlic. Because I love garlic I doubled up but you don’t have to. I Waldo seasoned the chicken on both sides first with onion powder, garlic powder, parsley, and lawrys seasoning salt and some pepper before adding it to the marinade because I like my meat really flavorful. I put it in the plastic bag and let Last night and didn’t take it out until about 9 o clock tonight and it was delicious! So about a day but I’m sure if you let it sit for 4 hours or so it would still be just as good! Thank you sooooo much for this recipe I really loved the added brown sugar it balanced out all the other flavors! This was EASY, QUICK and DELICIOUS. I doubled the recipe for 6 chicken breasts. Cut the cooking time to about 14 mins. by pounding them first to an “even” thickness, between 2 sheets of wax paper. 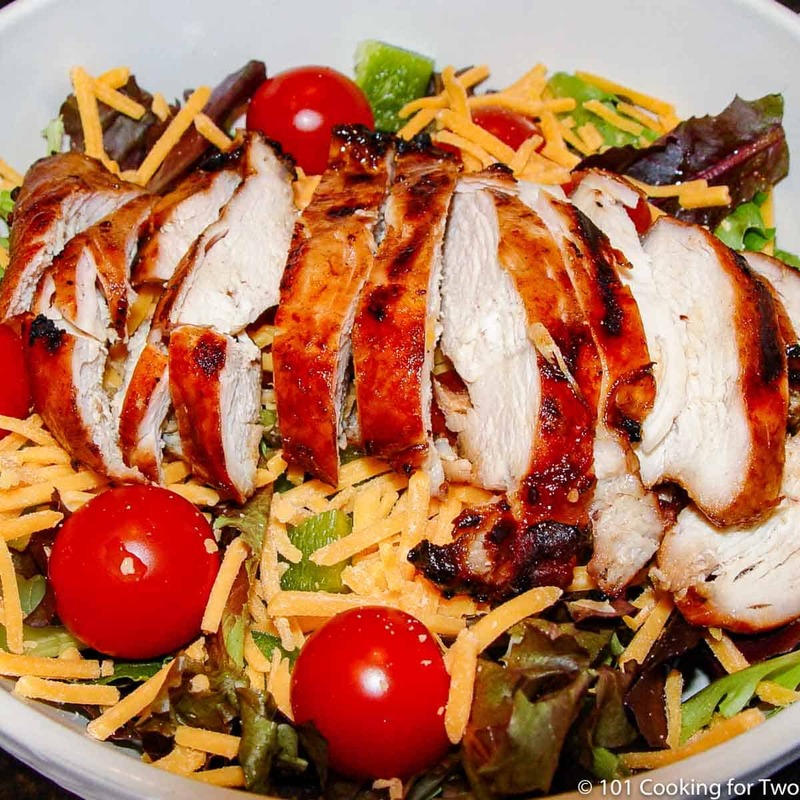 Sliced and served warm over cold salad – perfect summer dinner!! 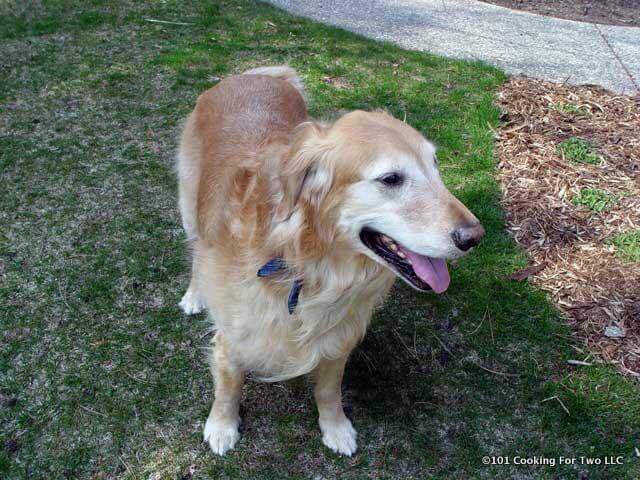 Hi Pam, I have started to “pound the chicken” some too but haven’t decided yet if I want to do it all the time. First my wife always thinks it should be on a sandwich. Second, the times I have done this it seems dryer and I’m a careful griller. 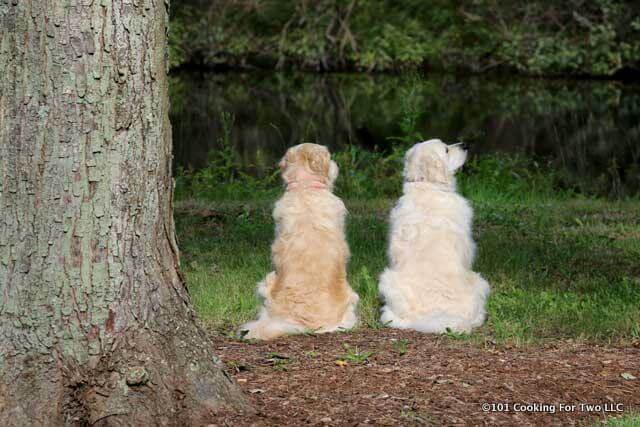 I’m not done evaluating yet. I even slightly screwed up the recipe and it still turned out great! You can check out my review here. I made this tonight per instructions (I didn’t get a chance to try the brining part) and I have to give the author some SERIOUS compliments! This is hands down the best chicken marinade I’ve ever tasted or used. It is now my go-to marinade for chicken and I especially love how quick it is to not only make but use considering I rarely think too far ahead for the need to marinate the meat I cook. It’s usually just an afterthought so I love that this had the chicken ready in a short time. Thanks so so much for posting this! And now I can’t wait to look at your other recipes. 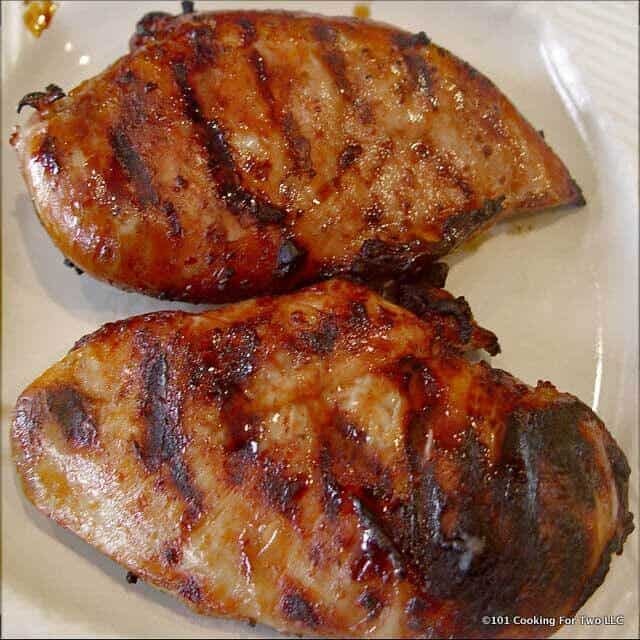 I buy chicken breasts in bulk packages, make a big batch of this marinade then vacuum pack and freeze for later use. By the time the chicken thaws it maninated perfectly and makes a quick clean up. Thanks! I tried this last night and loved it. It gave a good amount of flavor after 30 minutes of marinating (will try it for longer next time if I can!). I’ve never tried brining before, so that information is useful for me as well. I’ll have to give that a shot one of these days. Do try the brine, you won’t believe the change in moisture. I was using this recipe last weekend again. I really like that I always have the ingredients. Did you use a tablespoon or teaspoon for sugar, lemon juice, oil and salt? I used teaspoon since there is a lower case “t” by the ingredients, but it tastes very soy saucy…. just checking! Thanks! I went back to my original notes. You are right… And the garlic was left out. Fixed and please accept my apology. That was apparently a bad day. Thanks for the note. I will try upping the brown sugar next time. If my grill ever gets out the the snow. Longer is better but 30 minutes still gets very good results but not more than a couple of hours with this. my bad I see now that the info is indeed there – sorry! trying this tonight! Sorry for the confusion. This recipe is still in the format from Blogger and need converted so it looks better and is less confusing. I have about 2/3 of 300 done. They take 15 minutes each and I’m still working on it. would be real helpful for us newbs to know exactly how much of each ingredient goes in the bag to make the marinade instead of saying combine. Its all in the recipe above. Check it. Brining is a definite plus for boneless skinless breasts. I like the marinade, good flavor profile. I need a nice quick marinade for tonight. I can’t wait to try this.